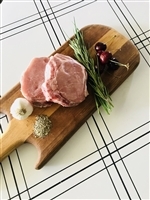 These pork chops are amazingly delicious and tender. The best chops you will ever eat! The bone gives them even more flavor. These pork chops will melt in your mouth! Amazingly tender and delicious right from our farm!